I can remember growing up hearing commercials on TV with the Folgers jingle. You know the one I'm talking about. "The best part of wakin' up is Folgers in your cup." Fast forward a few decades later (I won't go into detail as to how any decades.) and I can still hear that tune in my head from my childhood. My dad was what people would call a coffee drinker. That's pretty much all he drank from the time he got up until the time he went to bed. I can still remember the red coffee can that sat up on the shelf and how I looked forward to smelling it every time he opened it. I guess I was destined to be a coffee drinker myself and didn't even know it at the time. I'm sure my dad would be proud to know his little girl grew up to drink Folgers just like he did all those years. Of course I drink it with a little added flavor and not black like he did. I'm one of those coffee drinkers that needs a little bit of flavor to really enjoy my cup. Whether it be some creamer, a little bit of sugar, or just really good flavored coffee it has to have a little something in it. So when I heard about the Folgers Simply Gourmet line I was pretty excited to give it a try. The simply gourmet line is your every day Folgers with that little something extra added right in the bag. With six different flavors to choose from you'll never get board of any one flavor. I for one am quite fond of the Natural Caramel flavor. It has a smooth, yet subtle caramel undertone that's smells wonderful while it's brewing. 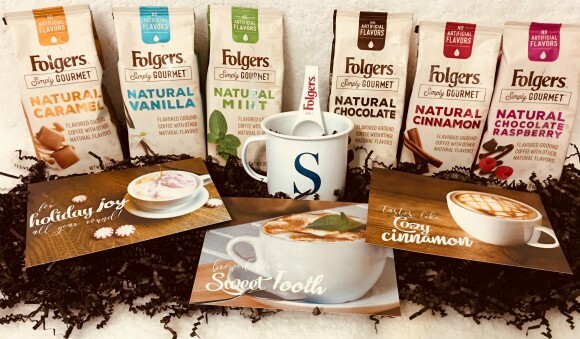 Folgers Simply Gourmet coffee gives coffee lovers the opportunity to enjoy delicious, natural flavored coffee, and to recreate their favorite fall coffee recipes with no artificial flavors, it says. Made with 100 percent premium Arabica beans, the coffees are perfectly paired and balanced with natural flavors to create six flavored coffees: Natural Vanilla, Natural Cinnamon, Natural Chocolate, Natural Caramel, Natural Chocolate Raspberry and Natural Mint.